It sounds fun to be treated like one, but let’s gather all the facts. (zuo4) (yi1 ge.) (gong1 zhu3) (you3) (xu3 duo1) (ma2 fan.). (to be) (one) (princess) (to have) (numerous) (trouble). A princess has much trouble. First of all, there are all kinds of tests. (yi1 ge.) (zhen1) (gong1 zhu3) (dei3) (hui4) (tiao4 wu3) (yi1 zheng3 ye4). (one, a) (true, real) (princess) (must) (to be capable) (to dance) (one complete night). A true princess must be capable of dancing the night through. the next morning she must sing while she cleans the whole house! because a true princess won’t be frustrated by a grumpy dwarf. (even if) (true) (princess) (recently) (just) (by, because of) (dragon) (to bring along) (to depart), (she) (still) (must) (be having) [(beautiful)(suffix indicating this is an adjective)] (head hair). Even though a true princess has recently been carried by a dragon, she must still have beautiful hair. so she must know clever conversation to distract the dragon. (suo3 yi3) (ta1) (neng2) [(zi4 zai4)(de.)] (gen1) (ye3 sheng1) (dong4 wu4) (xiang1 chu3) (shi4) (zhong4 yao4). (so) (she) (able to) [(self + exist with = at ease)(adjective indicator)] (with) (wild) (to move + things = animals) (to get along with) (to be) (heavy + must = important). it is important that she is at ease with wild animals. she must have patience, not forgetting that her prince will come sooner or later. (bu2 guo4) (zhun3 bei4) (sui2 shi2) (jin3 kuai4) (ke3 yi3) (li2 kai1). (however) (prepare) (any time) (as quickly as possible) (can) (depart). but be ready to leave at a moment’s notice. (she) (to have to) [(to make) (people) (looks coming)]❻ (every) (measure word for following word) (affairs, matters) (all) (very) (easy). She must make it all look easy. (xian4 zai) (ni3) (yao4) (zuo4) (gong1 zhu3) (ma.)? 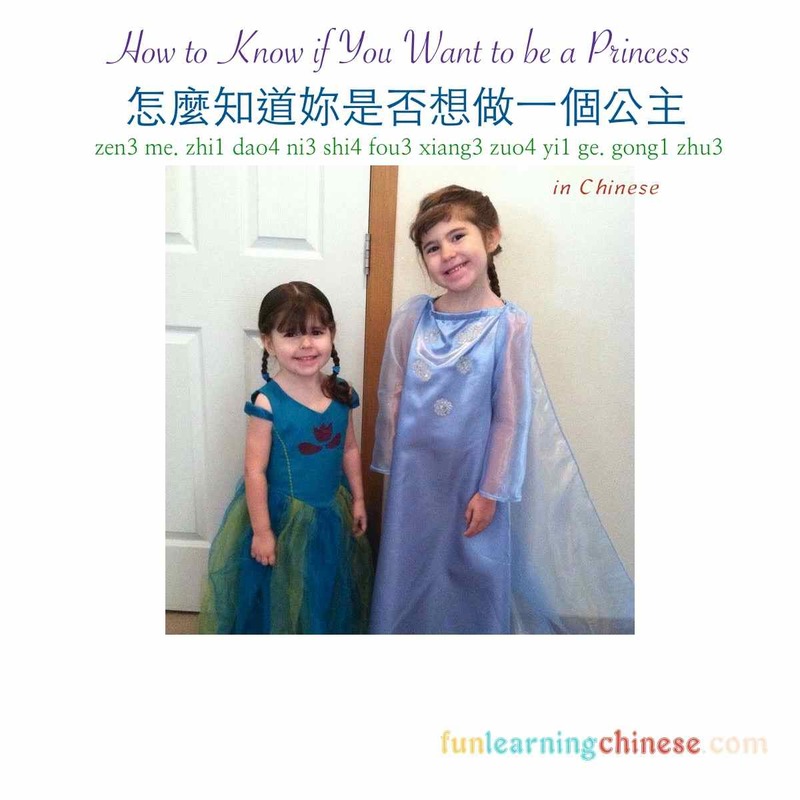 (now) (feminine you) (to want) (to be, to do) (princess) (indicates this is a question)? Now do you want to be a princess? ❷ Just like in English, there can be different words that mean the same things, for no apparent reason. In this sentence, 整 (zheng3), meaning “complete,”is used again in 整個 (zheng3 ge. ), “ge.” being the measure word or unit word for “house,” for the rhythm it gives the writing. 全部的 (quan bu de), which more literally means “all the parts of” could be used just as easily. ❹ Another way to say “even if” is 即使 (ji2 shi3), which is the same 使 (shi3) used in the above note.